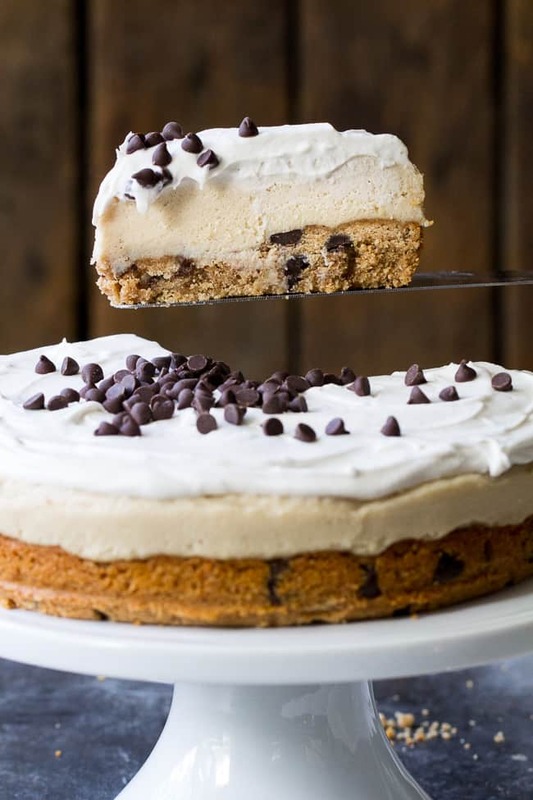 This chocolate chip cookie vanilla cheesecake starts with a thick chewy chocolate chip cookie layer topped with creamy cashew vanilla cheesecake, coconut whipped cream, more chocolate chips and a rich chocolate drizzle. It’s the perfect secretly healthy dessert for any special occasion! Gluten free, dairy free, paleo and vegan. Yes, your calculations are correct. This is the second paleo and vegan cheesecake recipe that I’m sharing on the blog in the span of a week – but really, can you blame me? I might not be training for marathons right now, but cheesecake marathons are another story – and SO my ballgame right now. Last week it was lemon strawberry, and today we’re going in another direction entirely. 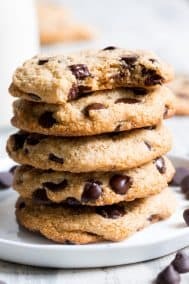 A direction where the streets are lined with thick chewy chocolate chips cookies and paved with chocolate glaze! And the houses are made of…vanilla cheesecake and coconut whipped cream?! Okay, I’ve gone too far, let’s talk delicious details before I lose you all. To start off, I had a decision to make regarding the bottom cookie layer – to bake or not to bake?! 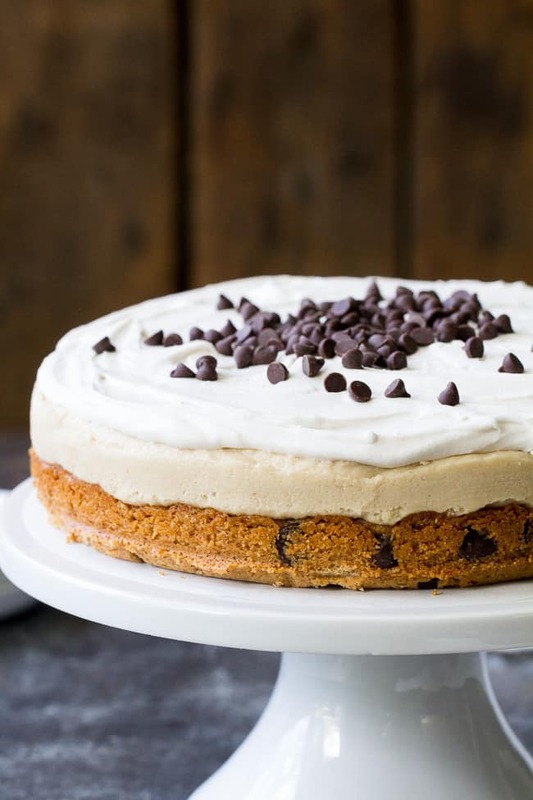 If I went completely no-bake, what we’d really have here is is cookie dough cheesecake, which of course would be ridiculously good, but, it wasn’t quite my vision. 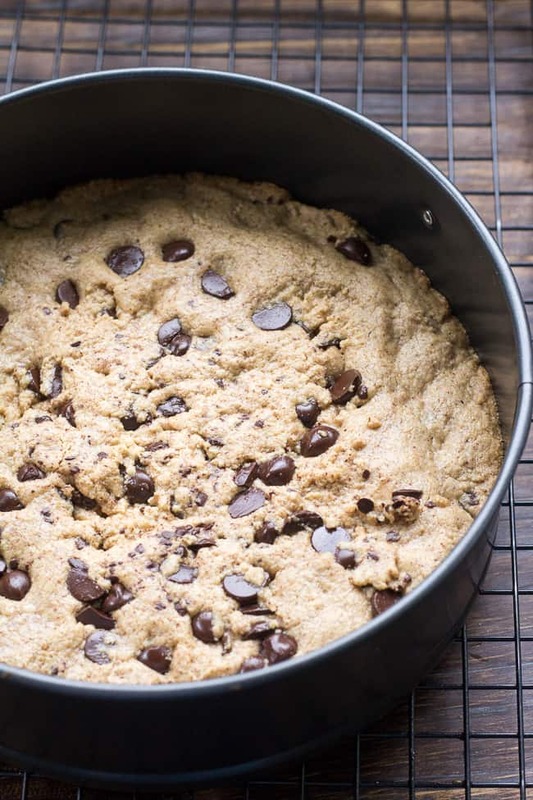 I wanted sort of a cookie cake topped with all the other creamy layers and chocolate, so I decided to bake the bottom layer into a thick, chewy, vegan chocolate chip cookie. 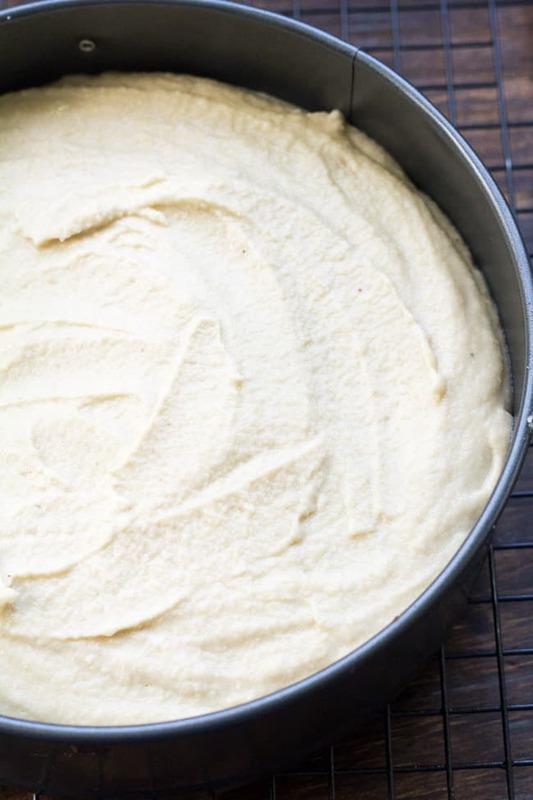 The cheesecake layer is a cashew based vanilla cheesecake, and GUYS! It turned out so delicious with just a few ingredients – cashews, refined coconut oil, maple syrup, vanilla, and lemon juice to give it the tartness of a true cheesecake. 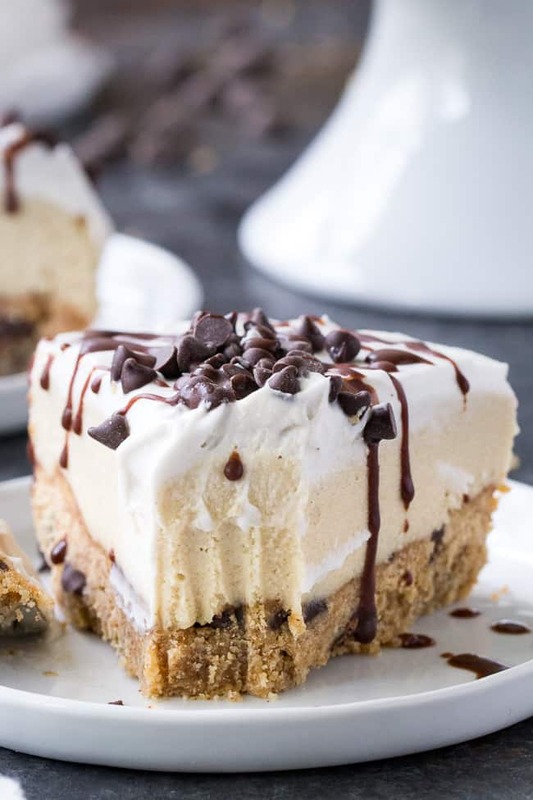 After blending the cheesecake mixture until nice and creamy, you simply pour it over the baked cookie crust and then chill until set. Make sure you use every drop – this is NOT a dessert you’ll want to waste any part of! Rather than freezing this cheesecake, as I did with my lemon one, I found that the texture for this one was just perfect after spending a night tightly wrapped in the back of the refrigerator. It turned out insanely creamy and ready to be topped with coconut whipped cream! 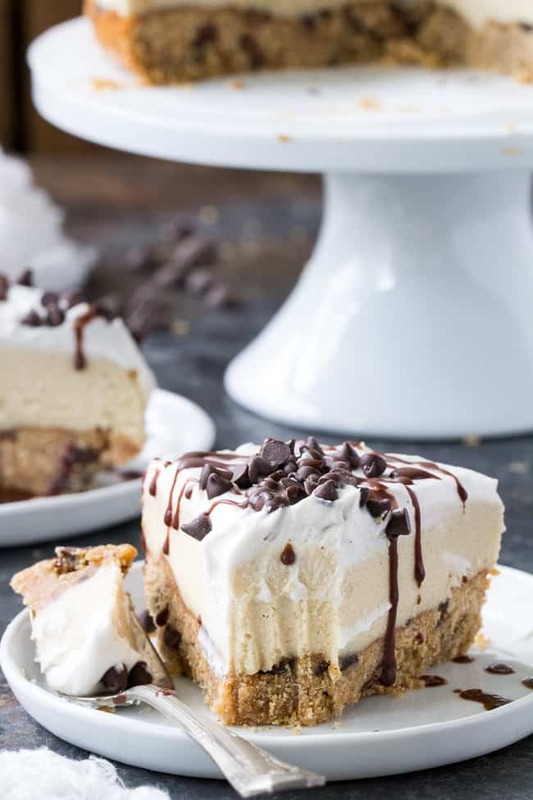 I made my whipped cream in advance and kept it refrigerated overnight as well, but you can just as easily make it right on the spot and spread it over the cheesecake. 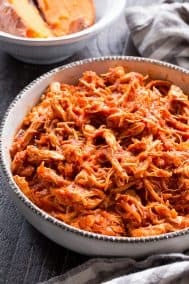 One note on coconut whipped cream – I used to recommend using either canned coconut cream OR the thick part of a chilled can of coconut milk. While it SHOULD technically be possible to use the cream from the can of coconut milk, I’ve recently had several bad experiences where it just would not blend properly into whipped cream. I DO think there are certain brands of canned coconut milk that are better for whipping, the one that seems to work nearly every time is Thai Kitchen. You simply chill the can overnight, and then scoop out the thick part only to make the whipped cream. If you plan to use canned coconut cream, Native Forest is the brand I use that hasn’t failed me yet. However, I do not recommend using Native Forest coconut MILK for making whipped cream – it’s let me down too many times! Lastly, I decided to add more chocolate chips and a chocolate drizzle, because, um, why not?! The drizzle is very similar to the glaze I used for my chocolate donuts, and hardens to a nice chocolate shell on the cold cheesecake. Make sure you allow the chocolate mixture to cool before drizzling though, so you don’t accidentally melt your cheesecake. After all that work, melting your cheesecake with a too-hot drizzle would just be so, so sad! 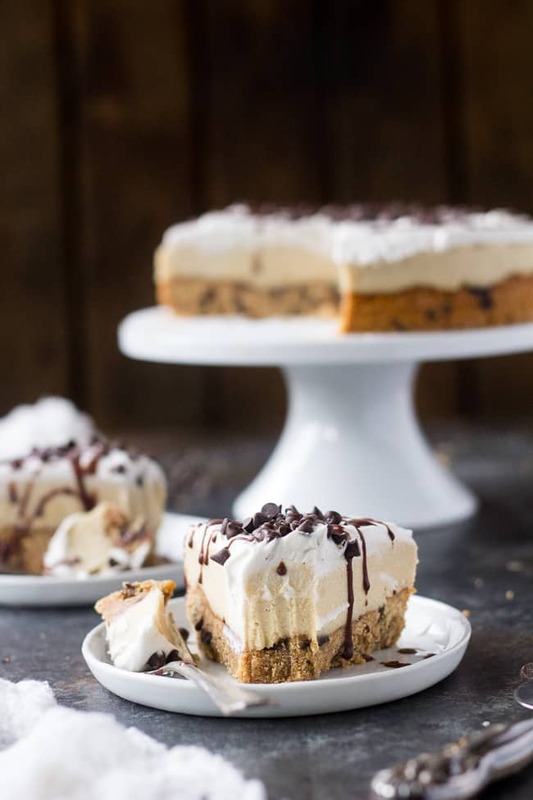 This chocolate chip cookie vanilla cheesecake starts with a thick vegan chocolate chip cookie layer topped with creamy cashew vanilla cheesecake, coconut whipped cream, more chocolate chips and a rich drizzle of chocolate. It's the perfect secretly healthy dessert for any special occasion! Gluten free, dairy free, paleo and vegan. Whisk together the almond butter, maple syrup, coconut oil, and vanilla until very smooth. Combine the dry ingredients in a separate bowl, then add to the wet and stir until a dough forms. Chill the dough if very sticky for about 5 minutes, then stir in 1/3 cup of the chocolate chips. After removing from oven, cool on wire rack in the pan. While the cookie layer cools, make the vanilla cheesecake layer. 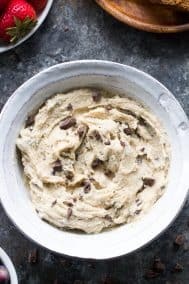 Combine all ingredients in a high speed blender or food processor, and process/blend on high for several minutes, scraping the sides as needed, until a thick creamy mixture forms. Pour the cashew mixture over the cooled crust (or mostly cooled) and scrape the sides of the blender to use up all of it. Now it's time for the cake to set. If you are in a hurry, you can set the cake in the freezer by covering and freezing for about 2 hours. To serve, allow the cake to thaw in the fridge for a nice creamy consistency. You can also set the cake in the refrigerator overnight - simply cover and place in the back of your refrigerator and wake up to a perfectly creamy cheesecake! 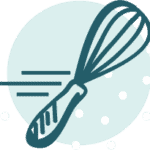 To make the whipped cream, use an electric mixer to beat the cold coconut cream until smooth and creamy, then add the maple and vanilla and beat until well combined. Spread over the chilled cheesecake before serving, top with more chocolate chips if desired. 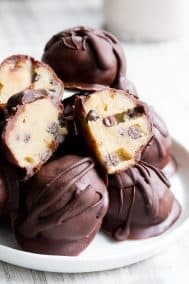 Melt coconut oil over very low heat, then immediately whisk in cacao and maple until a shiny glaze forms, remove from heat and stir in vanilla. Allow to cool to room temp before drizzling. Glaze will harden after being drizzled on the cold cheesecake. What’s the last think you ate involving chocolate? Hi I’m just wondering I’m eating healthy at the moment and I’m just wondering how many calories in one slice of this cheesecake? And can you habe a slice every day, or just one day a week? Hi! 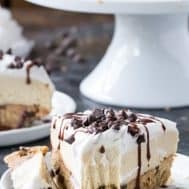 I’m not sure the exact calories, however here is a good online nutrition calculator that let’s you calculate stats for a recipe: https://www.verywell.com/recipe-nutrition-analyzer-4129594 Even though this is a paleo and vegan dessert, if your goal is weight loss I would think eating this every day wouldn’t be the way to go, since it’s still an indulgence. 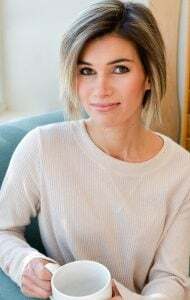 Hi, I love your recipes and am excited to try them. However, I recently found out that I’m allergic to coconut and eggs(although eggs aren’t in this recipe yeah). My question was would you have an idea what I could sub for the coconut flour? I’m wondering if I could sub organic palm shortening for the coconut oil? I don’t expect you to know all or do all substitutions but I thought I might ask just incase you had any suggestions and could save me time. Thanks in advance. 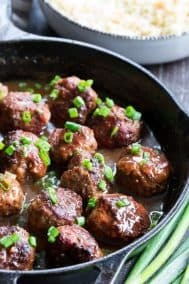 Any idea the approximate net carbs for this dish (or by serving if you tell me how many servings you say it makes)? Thanks! I would say 10 servings, hope this helps! Well, I’m eating homemade granola right now, so that answers your chocolate question! 😉 This looks absolutely DELECTABLE! Woah. Just…..woah. This is THEE perfect dessert for any and everyone, and it looks absolutely divine. Saving right now! This is insanely beautiful Michele; you literally paved this street of cheesecake with incredible creativity. WOW. I’m just wanting to dig into some of it right now. Thank you! 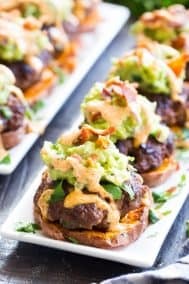 Those look tasty as well! I will be trying them out with my kiddos! I have made “nut cheese” with macadamia nuts instead of cashews. Maybe worth a shot for this. Not sure how that would work but sounds interesting! Can i use cashew butter instead? Raw cashews are necessary for the cheesecake texture, sorry! 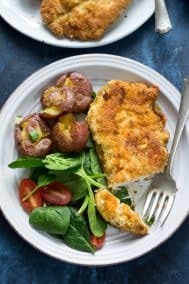 Could I use a gluten free flour blend (particularly Costco’s) for the crust? Not sure how the other ingredients would work with it to get the texture right, so couldn’t say the amount needed. Hey! 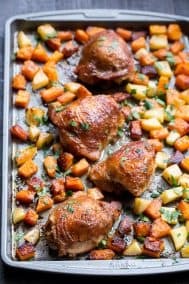 I was just going to attempt to make this but I don’t have that specific 8 springform pan.. Can it be baked just on a normal baking pan? Yes, I think you should line it with parchment paper though for easy removal. My nursing baby doesn’t do well with Almond… is there another gluten-free flour I can sub in? 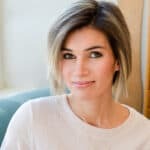 Would Oat flour work? This cheesecake is amazing! A big hit for company too. Thank you! That’s so awesome to hear! How long can it be kept in the fridge? I’m making it for Christmas Eve but have other things to make that day so I’d love to be able to make it in advance.